The sun sets on the Chesapeake Diaries, New York Times bestselling author Mariah Stewart’s cherished series based on Maryland’s picturesque eastern shore, with this romantic tale of a man who takes a second chance on love with the high school crush who broke his heart. Up-and-coming artist Lisbeth Parker finally has a chance to show the folks back home what it means to leave Cannonball Island and make something of yourself. As a native whose stubborn father forbade her from befriending townies, Lis always felt like an outsider in St. Dennis. So while her work is on display in the local art gallery, she records her ailing centenarian great-grandmother’s stories of the island’s rich history and spearheads a fight for its survival. Lis was Alec Jansen’s secret dream girl growing up, even after she flat-out refused to be his prom date. Now the handsome environmental engineer and the whip-smart beauty are on opposite sides of a debate over the island’s future. Hired to prove that developing the shore will have little impact on the area’s natural integrity and huge gains for its economy, Alec is determined to change his alluring, headstrong rival’s mind—and to win her heart. Driftwood Point is the latest in Mariah Stewart’s Chesapeake Diaries series. The peaceful setting wraps readers in a cocoon of warm summer nights and sweet romance. I loved this story for its down to earth characters and continuously moving plot. Lisbeth is a successful artist visiting her hometown of Cannonball Island for a local art show. Arriving home she doesn’t expect to find that her great-grandmother Ruby has made convenient changes to her home and general store. Change seems to be the main theme for this novel. Lisbeth grew up with a father bent on hating the residents of St. Dennis for a perceived past wrongdoing. Returning home brings an opportunity for her to adjust her perspective and determine where she’s meant to be. She struggles between resisting the inevitable changes of her island and embracing them as those around her attempt to keep pace with the changing times. Lisbeth is the kind of character you want to see succeed even though she doesn’t have all the answers. It’s enough to see her love for family and community. She’s one that takes center stage in a story even when there are other character perspectives thrown into the mix. Living near the beach myself, I felt that I could relate to the setting. The imagery was realistic and made me feel like I could just take a trip up to Cannonball Island on my next road trip. But despite the comforting setting and interesting storyline, Driftwood Point turned out to be an average read. The story reads like a typical romance, but not the kind that fully captures you until the last word. Alec and Lisbeth had a connection that was sweet and simple, but there was potential for more depth, or drama, that I felt was overlooked. On the other hand, if you're not looking for a saucy, tense love story you will appreciate the subtlety of the romance. The ending didn’t take me somewhere unexpected or leave me on a note of thoughtful reflection. At some point I simply felt like I knew where it was going and in the end I was still hoping for a dramatic twist. 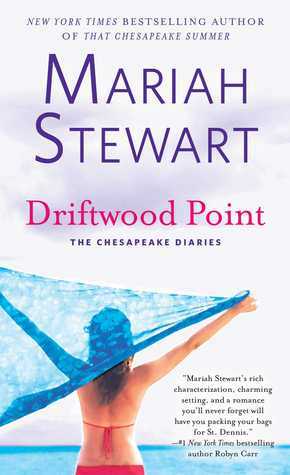 Longtime fans will find that Mariah Stewart’s characters are still welcoming visitors, even if its just through the pages of the Chesapeake Diaries. This summer read will be the companion for stints at the beach or road tripping across the country!